London—There never was a London June like this. 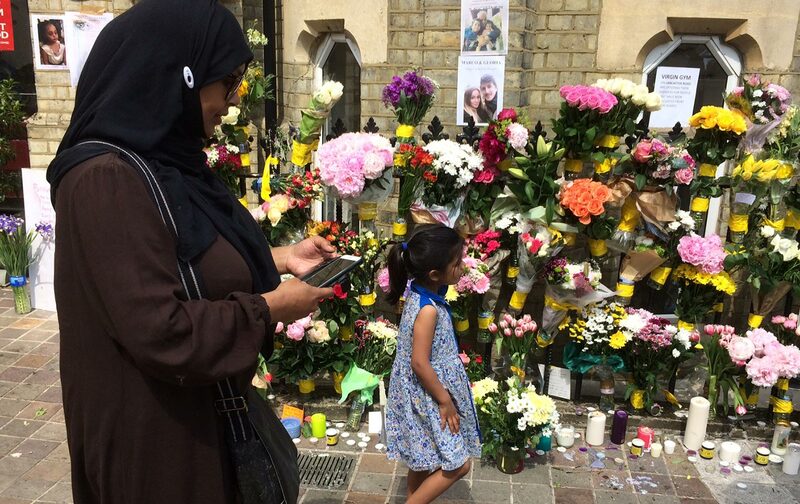 In the early hours of this morning, with ash still in the air from last week’s catastrophic fire at Grenfell Tower, a man shouting “I want to kill Muslims” drove a van into a crowd of worshipers leaving a mosque in North London after taraweeh prayers for Ramadan. The attacker was caught and held by members of the congregation, while the imam urged the crowd not to harm him. One man (already receiving first aid before the attack) died at the scene; eight people are injured, two of them seriously. This is the third terrorist attack in London and the fourth in Britain since March—and the first to target Muslims. Something is building, frightening, uncertain, anxious, hopeful too. Last year’s Brexit vote, this year’s wave of atrocities, Labour’s unexpected success in the June election, the terrible high-rise inferno—all have uncovered sharp edges ignored for years by the comfortable, glossed over in politics and the mainstream media. They won’t be easily buried. The Grenfell Tower fire was the lethal consequence of years of putting profit before people’s lives; it happened in London’s wealthiest and most unequal borough, which, for the first time ever, elected a Labour MP this month. Kensington’s Notting Hill was once a lively, mixed community, settled in the 1930s by refugees from Franco’s Spain and in the 1950s by Britain’s first wave of West Indian immigrants. In the 1960s it was split in two by the Westway, an elevated highway; the cut-off northern end was left to sink into poverty while a tide of gentrification swept up from the south. The stuccoed Victorian terraces that line its leafy crescents were snapped up by yuppies in the booming ’80s; many of its luxury flats now stand purposely empty, occupied only by overseas investment capital. The brutalist, 24-story Grenfell Tower was built as public housing in the 1970s, one of several high-rises clustered near the Westway. Home to 120 families, many of them first- or second-generation immigrants, it was mismanaged on behalf of the Kensington and Chelsea council, which failed for years to respond to urgent warnings about fire safety from a tenants’ organization, instead threatening the group’s blogger with a lawsuit for defamation. An £8.7 million refurbishment was completed in 2016, with cladding to improve insulation–and the view of the building from the posh streets to the south. The polythene core in that cladding, which went up in flames like a nylon nightdress last week, is banned for tall buildings in Europe, the United States, and—according to a senior government minister—in Britain. It was installed instead of a fire-resistant version, against the manufacturer’s strong warning, for a total saving of around £5,000. Now the black hulk against the sky transmits an awful silence. You can hear it over the hubbub of the people gathered by the Notting Hill Methodist Church to grieve, to volunteer, to protest, to be there. Two women whose families are missing seem have come because they can’t bear to be anywhere, even in their own skins. The fence is covered with flowers in bright summer colors. A forest of microphones waits for the police commander. When he comes, he’s humble, hatless, promising a full criminal investigation, apologizing that it takes so long—maybe months—to bring out the dead, some of whom may never be identified. Yellow tape on the pavement marks a media-free zone, but each time somebody speaks a circle forms around them, smartphones raised to record. There are people serving halal chicken, offering acupuncture, giving out tealights, standing in dazed shock. Everything is jumbled, tangled: grief, rage, voyeurism, empathy, solidarity, shame. It’s alive, a London crowd, the heartbreaking, generous messiness of community. Five days after the fire, no government agency has taken charge of relief. (Responsibility has today been given to a city-wide body.) Families who’ve lost everything have been shunted between hotels, some of them frightening high rises. The piles of clothes and toiletries donated by Londoners still languish in church halls. The money raised through crowdfunding—more than £3 million to date—is also sitting waiting. At the Notting Hill church, a woman who happens to work at a hotel where families have been housed leans on her sister’s back to write a list: “Clothes, all ages, plus sizes. Children’s socks. No more toiletries.” Hanan from the Rugby Portobello Trust, a local youth charity, can’t contain her frustration: “I have doctors, imams, football players coming to offer help. We have thousands of donated things but we don’t know where to take them. We’re ready to look after people but we don’t know where they are. The council have done nothing.” Most of the little trust this community had in government went up in flames last Wednesday. The rest has been squandered since. Grenfell Tower could have burned at any time; there are countless high rises still standing that could go in the same way. The latest police estimate, which goes up every day, is 79 people missing, presumed dead. The inquests and inquiries and investigations will take years. But the turning point is now. The fire came at a moment when Britain’s nerves are raw, its politics in upheaval. Fatally wounded by the election, Theresa May failed utterly to respond like a human being to the tragedy. Even the Queen, at 91, managed to visit survivors and show some emotion. Jeremy Corbyn was there right away, putting his arm around people, listening; Today he’s at the mosque that was attacked last night, which is in his constituency. It’s politics, of course, but it’s real, too. There’s a gaping rift between London’s multiethnic community of neighbors and those who live in bubbles of indifferent privilege. There’s also compassion, connection, and remorse: Thousands have pitched in with help for the survivors. This is a moment to seize. Anger and grief can dissipate in depression and violence, or they can be channeled to build, to take the levers of power and change our disastrous course. Editor’s note: This article has been updated to reflect the fact that relief for the fire was assigned to a city-wide body, not a private trust.